Looking cool in a tight spot is largely knowing what to do. 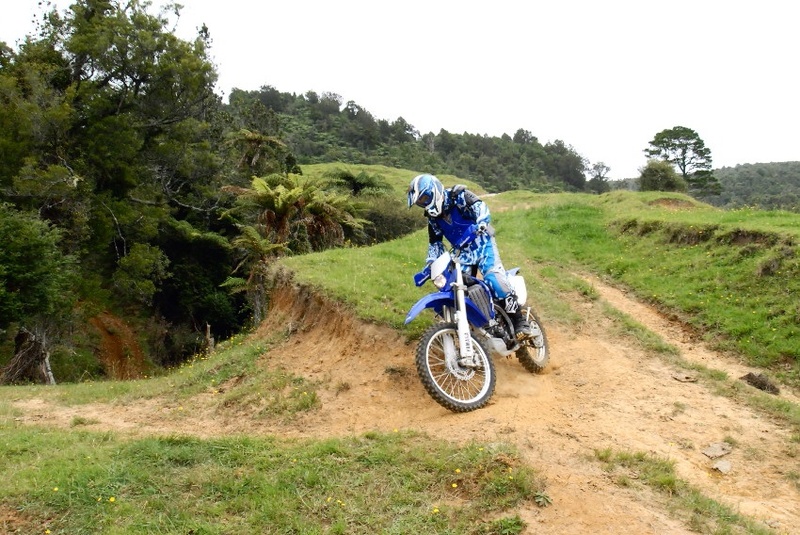 Ultra tight turns are a part of trail riding in New Zealand. If you can’t easily ride the turn on full lock here are a couple of techniques to handle tight corners in both up and downhill situations. Note that the two techniques are quite different. Going down we can use gravity to help maintain the fairly easy brake-slide technique, while going uphill we have gravity against us and need to perfect a slow leaning wheelie. 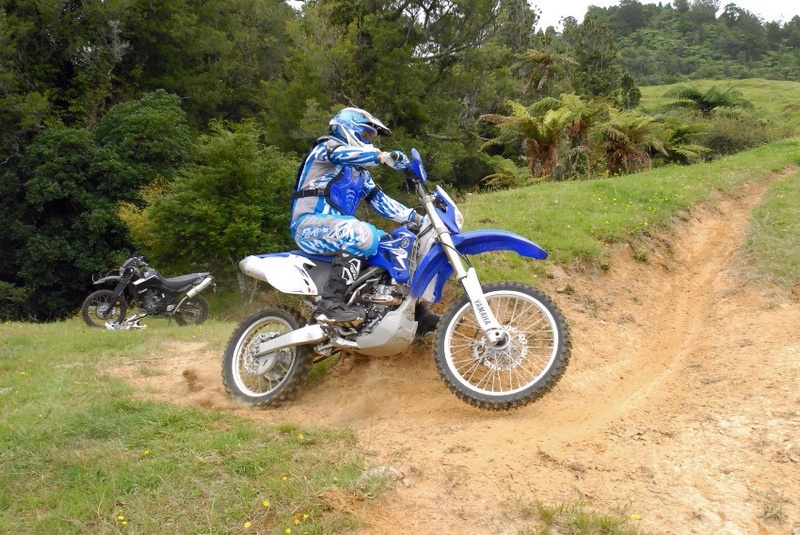 In this situation the best technique is to slide the rear wheel through the turn. This has the effect of making the bike turn far tighter. The more you slide the rear wheel, the tighter the turn. The technique works best standing, as in this position you can get most of your weight centered on the front wheel, helping it grip and at the same time making the rear wheel lighter, so it can slide easier. 1. 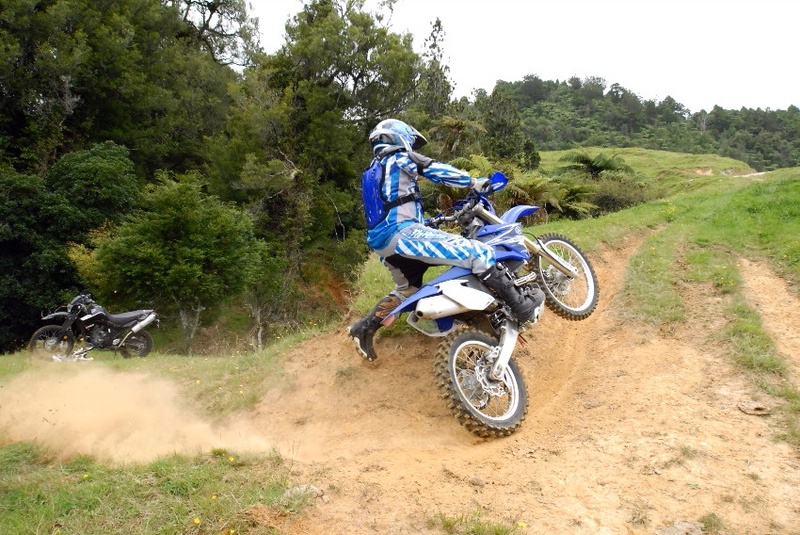 Line up your approach in second gear, crouching on the foot pegs with your weight centered in the usual braking stance. 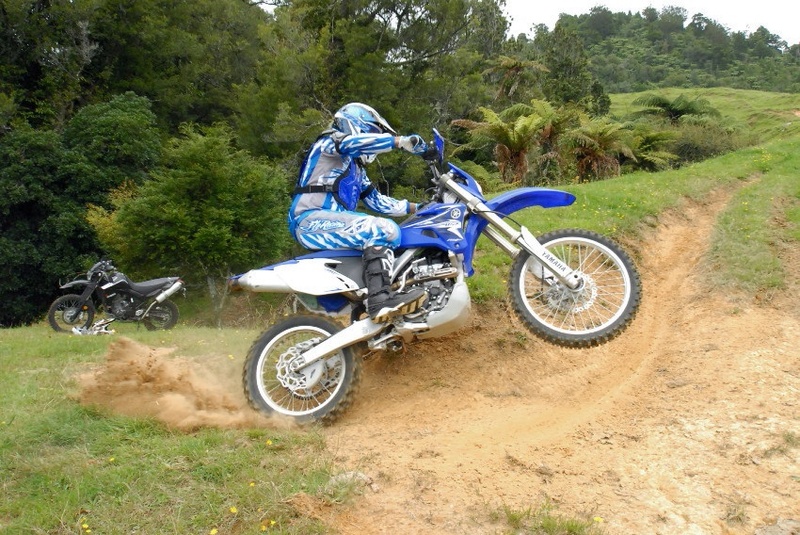 Begin to lean and turn the bike slightly towards the corner. 3. Push the inside handlebar down and in towards the turn. This will increase the angle of the slide into the turn. No matter how it feels, keep your feet up on the pegs. 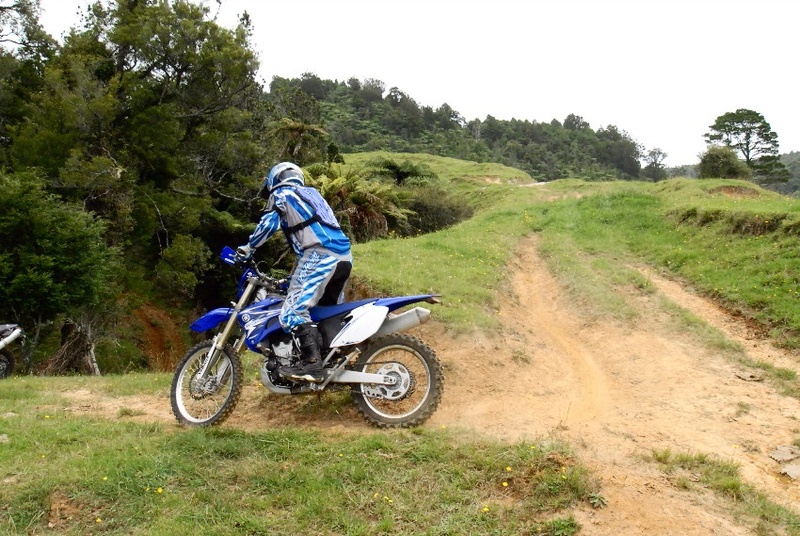 If you judge the bike is turning too sharply, or sliding out, release the rear brake for a second. This will send the bike wider again, but be ready to instantly apply more rear brake slide to finish the turn. 2. 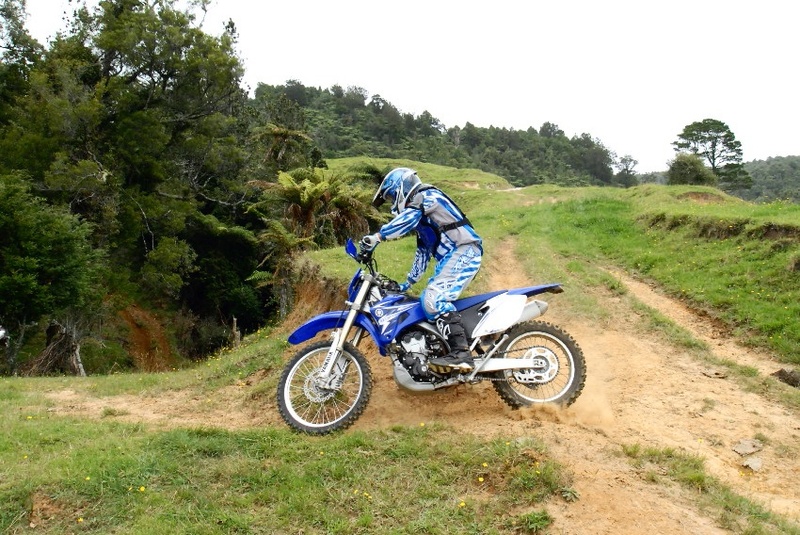 Getting off the front brake, lock up the rear brake while pulling the clutch fully in. Move your shoulders forward to be centered over the bars. The rear wheel is now sliding. 4. The tight part of the turn is complete and its time to let the clutch out and get back on the power. Though this is exactly the same corner, we use a completely different leaning wheelie technique going uphill. If we get off the power and try to slide the rear wheel going uphill, the bike will stop, so we are going to keep the power on and wheelie the front wheelie around to tighten the turn. Assume for the exercise that we need to exit via the left side rut. 1. Approach steadily in second gear, this time sitting and fairly well back on the seat. Lean and turn the bike towards the turn. Look for the apex point and be ready to plant your inside boot well forward on the bank. 3. Keep the bike gently wheeling while leaning into the turn and propped by your leg. If you get it right the bike will now be turning around the point you have propped. 2. 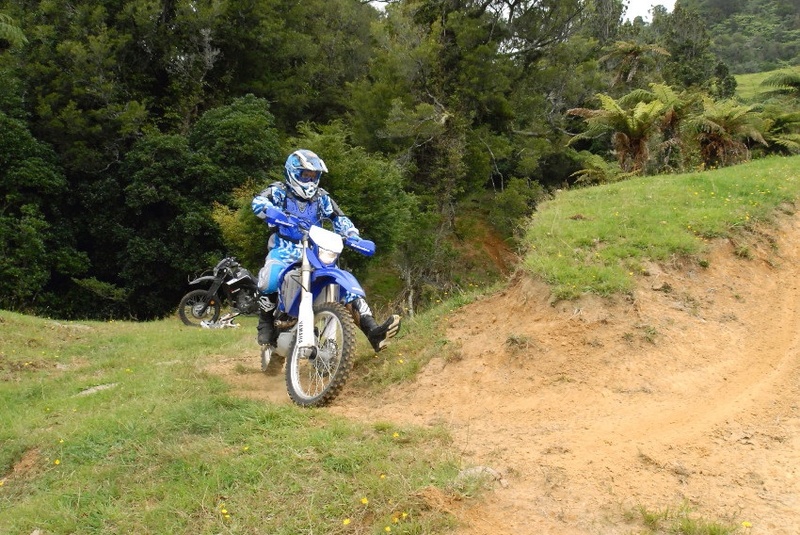 Keeping the engine at a constant low to mid rev range, use the clutch to pop and hold a small wheelie, while at the same time planting your boot at the apex of your turn. Try to get your weight well back. 4. 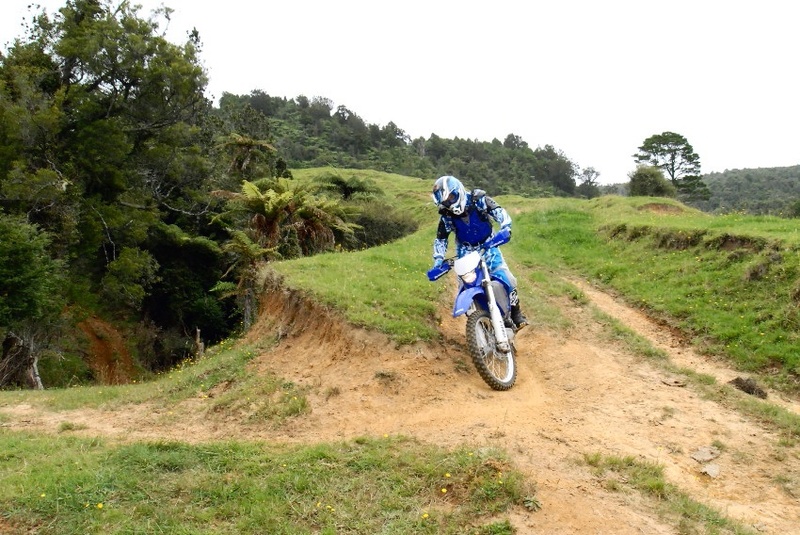 Now its time to stop the turn and get the weight off your inside leg and the bike upright. Gently increase throttle and extend your outside leg to increase weight to the outside peg to straighten the bike up and get on your way. If you are having trouble performing the low speed sitting wheelie you may need some intense home driveway practise. Use the expansion cracks in your drive as markers. From a standing start try to wheelie over the cracks, dropping the front wheel between cracks. Use the clutch and low revs and try beginning with first gear.